35 degrees, blazing sunshine and extreme humidity. 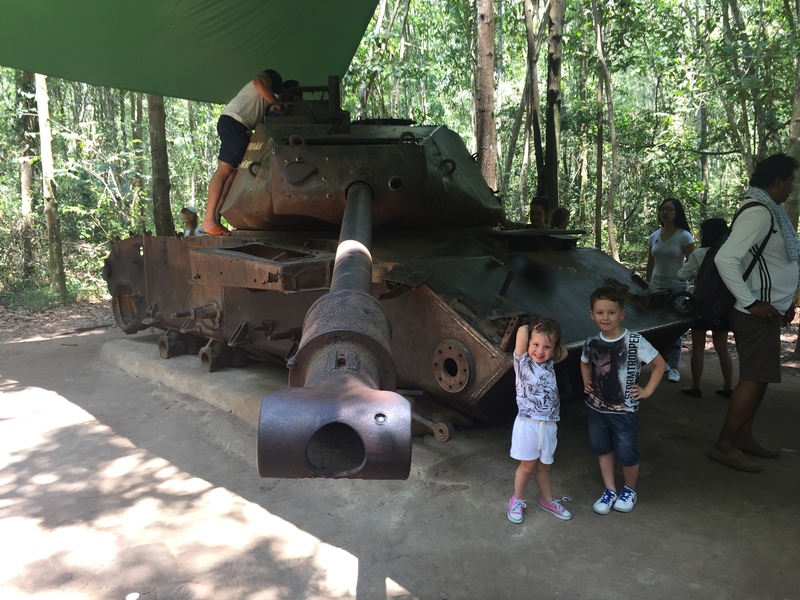 What better way to spend a morning than dragging a 5 year old and a 3 year old through the Vietnamese jungle, crawling through claustrophobically thin tunnels up to 8m underground and all with a background soundtrack of live weapons fire from thrill seeking tourists paying $1/bullet to play with an AK47? I love the smell of mosquito repellant in the morning. Where is it and what’s there? 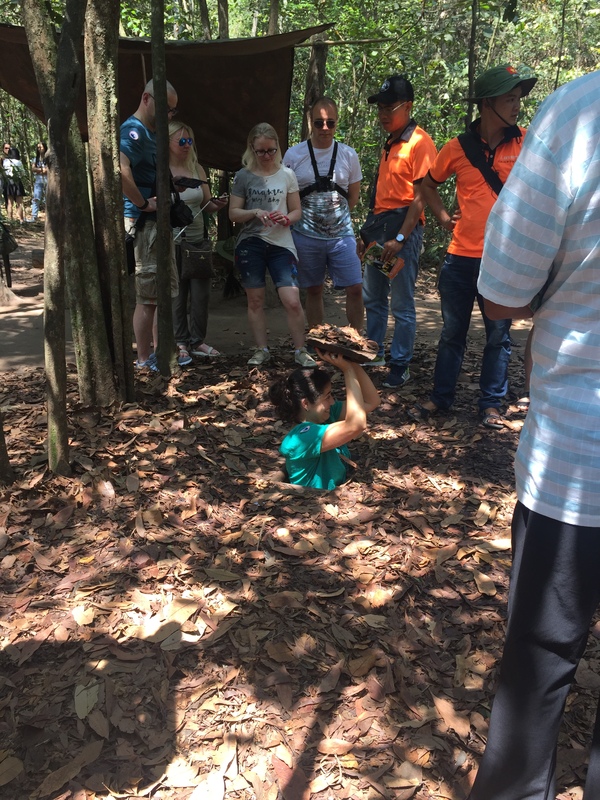 Located around 40km outside Ho Chi Minh city and taking around 90 minutes to reach by road, the Cu Chi Tunnels are an essential stop for anyone with an interest in the conflicts which have played such a central role in the country’s recent past. For those without such inclination, the tunnels still offer an interesting day out and for children, the small hidden entrances to the tunnels, numerous demonstration traps, mannequins (both static and moving) and traditional houses and bunkers, should be more than enough keep them occupied for an hour or two. The tunnels themselves are a network of bunkers connected by over 250km of narrow, hand dug passageways beneath the jungle. 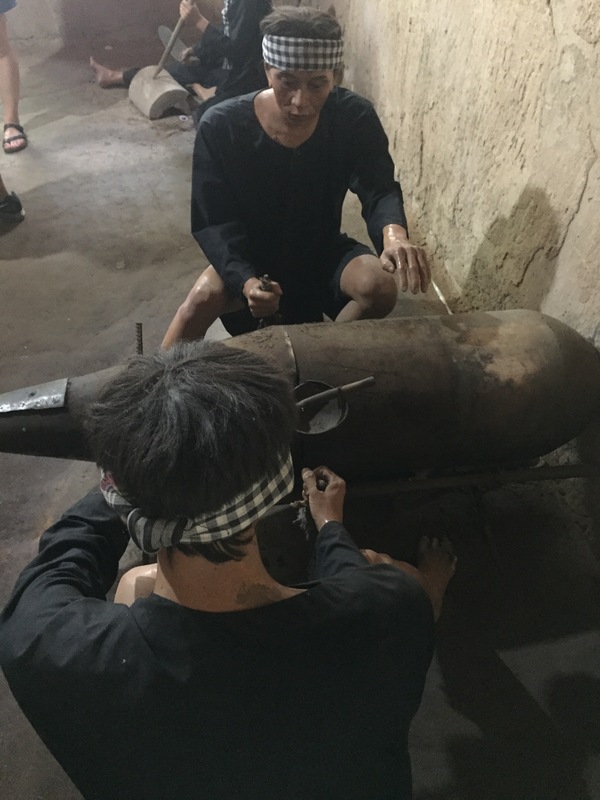 For more than 20 years, they played a crucial part in the conflicts with both the French and the US and a visit to the tunnels today provides an appreciation for just how much the Vietnamese have endured in recent history. As one of the areas main tourist attractions, buses and guided tours are easy to find in and around Ho Chi Minh city and many are extremely reasonable. We booked with a local company called ‘A Travel Mate’ through Viator.com and the trip for the four of us, including minibus transfers to and from the hotel, English speaking guide, tunnels entrance and water, was a little over $60. However, as with many previous tours, the prices if booked on arrival were cheaper still. Do expect the obligatory visit to a commission based ‘traditional factory’ of one kind or another on the way there or back though. We visited a lacquerware workshop, staffed by victims of war, where egg shell pictures are made and sold. It was all very low pressure compared to similar experiences in India, but still a bit of an inconvenience when children have just fallen asleep on the bus or are just dying to get where they were supposed to be going. We spent roughly 2 hours at the tunnels themselves, leaving around 13:00 and by the time we got back on the bus to come home we were all ready for it. Killer heat and humidity, combined with jungle bugs and not an insignificant amount walking, meant that a couple of hours was just about the perfect amount of time for the trip. 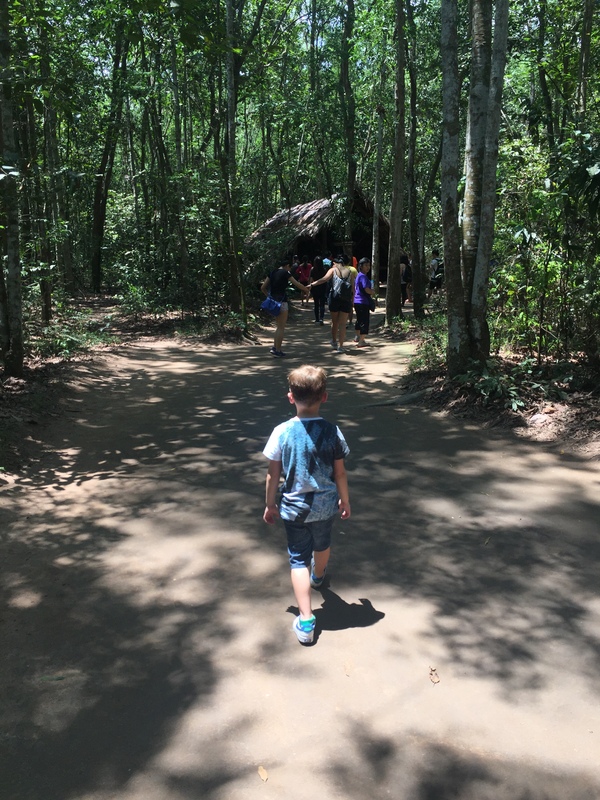 The layout of the Cu Chi tunnels site is organised such that you pass from one thing to the next on an anticlockwise route through the jungle. So, like a tropical, booby trapped, Vietnamese Ikea, you will see everything so long as you stick to the path and follow everybody else. 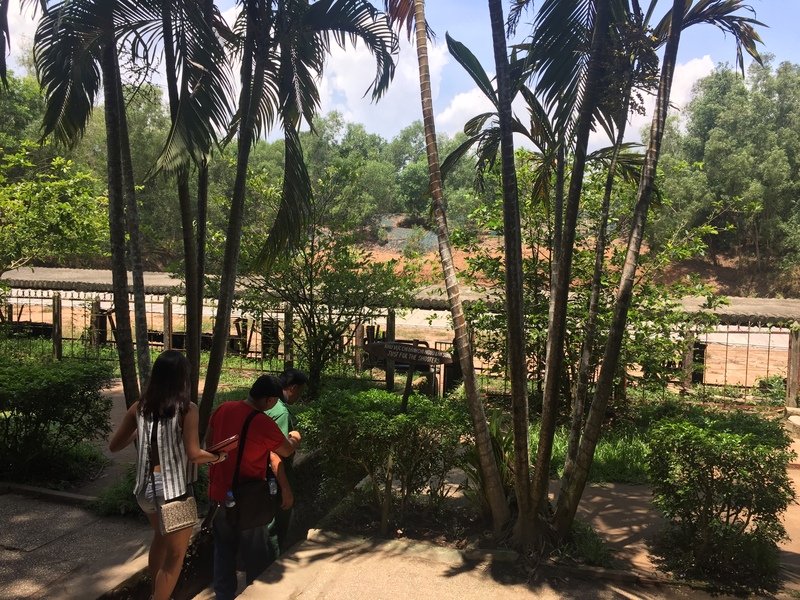 Immediately after the ticket office, you pass a collection of weapons, both US and Vietnamese and beyond this there is an underpass that takes you into the jungle proper. After having your tickets checked at the mid point, you emerge in front of several buildings constructed of wood and foliage in which you can watch various films about the conflict. Beyond this is the demonstration ‘hidden entrance’; the thing you will see on just about every review or website detailing the tunnels. A hole in the ground not much bigger than a piece of paper, you can tell the location of the hidden entrance by the sheer number of people crowding around it, waiting for a turn to try it out. These are the places that the VC soldiers would disappear into the tunnels or use to reappear behind their enemies. If you’re still not sure where it is, look for a group of portly western tourists surrounding a group of Asians with cameras. These are the people hanging back to determine whether ‘having a go’ at fitting in would be worth the embarrassment of getting stuck. I know because that is exactly what I did. If crouching in a small hole underground whilst a lid is lowered in sight of dozens of other tourists isn’t your thing, there is also a larger ‘normal’ entrance just behind the hidden one to demonstrate how soldiers would usually have entered and exited the tunnel network. The path continues, winding through the trees past other entrances and artificial termite mounds, which are actually used for tunnel ventilation, until you reach a damaged US tank. The tour guides at this point split into two, largely contradictory, camps. On the one side we had our tour guide and numerous others extolling the virtues of respecting the past and encouraging us not to climb onto the tank if we wanted pictures. On the other side there were numerous tour guides actively encouraging their charges to climb the tank and offering to take pictures for them. I’ve already expressed my views on war remnants here, but needless to say, our tour guide’s leanings when it came to tank climbing made me more inclined to give a good tip at the end of the day. 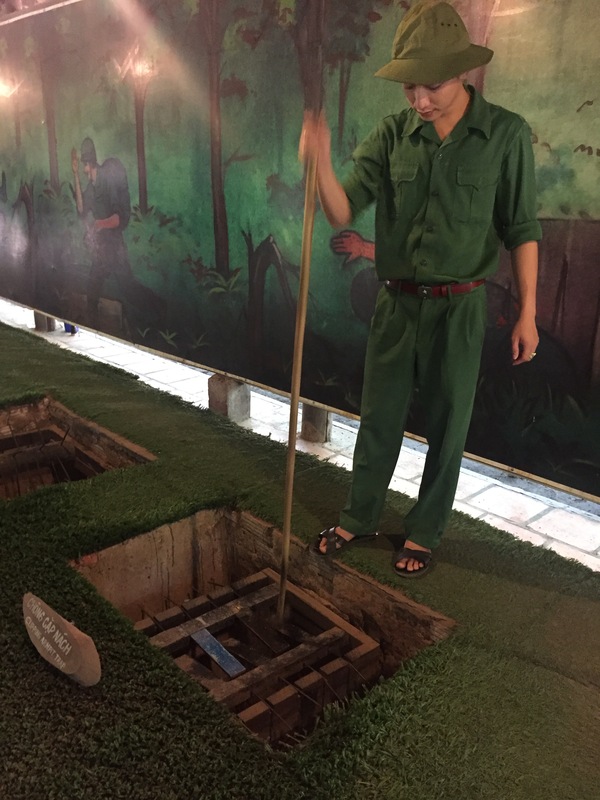 The Viet Cong were well known for their ingenuity at war and nowhere is this more obvious at Cu Chi than in the trap demonstrations. The evil looking barbed spikes, the pit traps and the vicious snap of snares really grabbed the interest of our eldest who was enraptured by the man demonstrating how they worked. Located in two long buildings just after the tank, the trap demos are operated by a man with a long stick who walks along activating and resetting the traps so that visitors can see them in action. They all involve some unfortunate soul unsuspectingly falling into a hole and then having to have various parts of his anatomy shredded or cut off altogether to escape. They’re also all ironically made from the metal stripped from US military hardware. He pointed to a special board covered in spikes that had been added to the trap just to impale people in the crotch area. Clearly you didn’t mess with these people. After the trap demonstrations there are numerous tents and facilities that you can visit which detail everything from cooking and sewing to arms manufacture and planning. All are filled with examples of things like uniform and munitions and most have mannequins to demonstrate what happened in that particular place. Beyond this is the source of the soundtrack to our day. Live weapons fire. 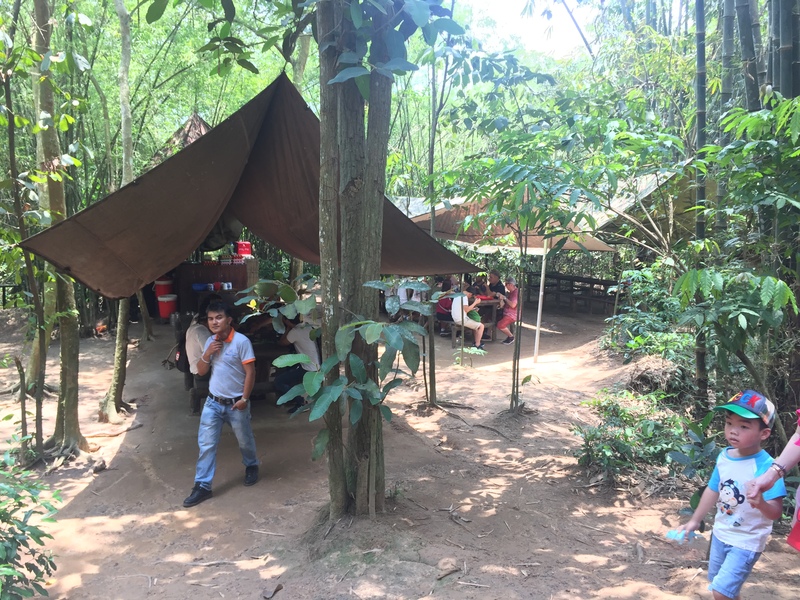 For all of our visit, the sound of short bursts, single shots and automatic fire resonated through the trees, making the place sound like a real war zone. The source of sound was the firing range at the far end of the site which allows tourists to experience firing a number of weapons used during the conflict. (But not the fabled Cambodian ‘Fire a rocket launcher at a cow’; sorry folks, it doesn’t exist). Looking out onto the range (you can’t enter the range itself if you haven’t paid to shoot) it really was just people stood wearing ear protectors and pulling triggers; the bullets thudding into a mud ‘quarry’ and hitting the same place that hundreds of bullets had before them. The noise was horrendous up close. We spent a few minutes flinching every time a shot was fired and watching a few people who were obviously insane trying to drink coffee next to the range without throwing it all over themselves with every BANG and then left. 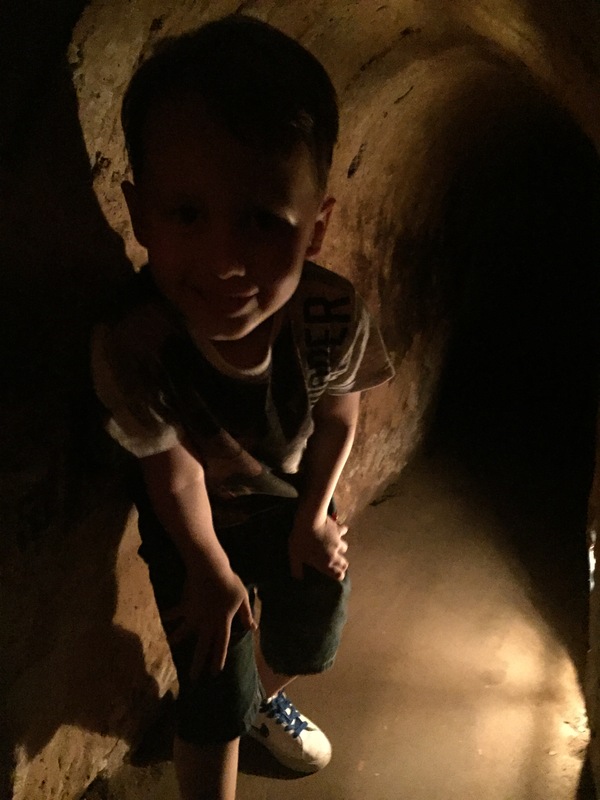 As you come almost to the end of your tour, you are given the option to experience the actual tunnels (albeit made safer and with some more entrances and exits added in case of emergency). Our guide explained what they were like and asked if we would like to have a try. Great! This was it! The part of the tour I had been waiting for! I enthusiastically volunteered to try. I couldn’t believe it. All this way for nothing. I was going to have to sit outside, the western outcast in a group of petite Chinese ladies who were all getting ready to head down and experience what I had been looking forward to. 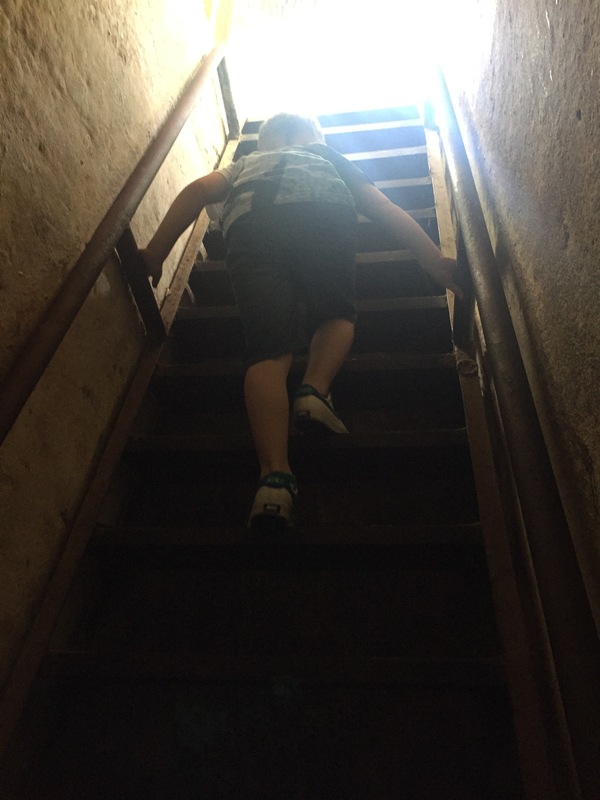 I peered down the steps to the tiny entrance hole and determined that, if needs be, I could commando crawl the first 25m and, feeling brave, sent my 5 year old son ahead as an advance scout party. Inside it was small. But not too small. Crouching down and almost bent double, I could manage an odd walk without having to crawl. Remembering the guides words of ‘take the right tunnel, the left one takes you to Cambodia’ we navigated the 25m to the first exit and feeling as if my thigh muscles were about to give up from the exertion of my odd crouch, we left the tunnel at the first exit and climbed the ladder back to ground level. Our trip was booked via Viator.com with ‘A Travel Mate’. Tour included English speaking guide, minibus drop off and collection and ‘Tea & Steamed Tapioca’ at the tunnels. Next postSouth Lakes Safari Zoo: Britain’s Most Controversial Zoo?